I've had this blog post set to go for ages now, but never got around to posting it because other things kept pressing their way in front. To the point now: fries. Salt & Vinegar fries. I first conceived the idea for these things when I walked into the spice and tea shop on Prince George Street in Williamsburg and saw the bottle of vinegar powder on the shelves. It's no secret to my friends-and-relations that I love salt & vinegar chips. Kettle-cooked are ideal, and for a nice toss-up there's nothing yummier than Utz Kettle-Cooked Maui Barbeque which is basically the love-child of salt & vinegar and a good, high-quality BBQ chip. So when the spice-shop owner told me that people have tossed vinegar powder into their mashed potatoes, it got me thinking. But I didn't want mashed potatoes in August, thanks. Instead, I decided to dedicate my pouch of vinegar powder to salt n' vinegar fries. 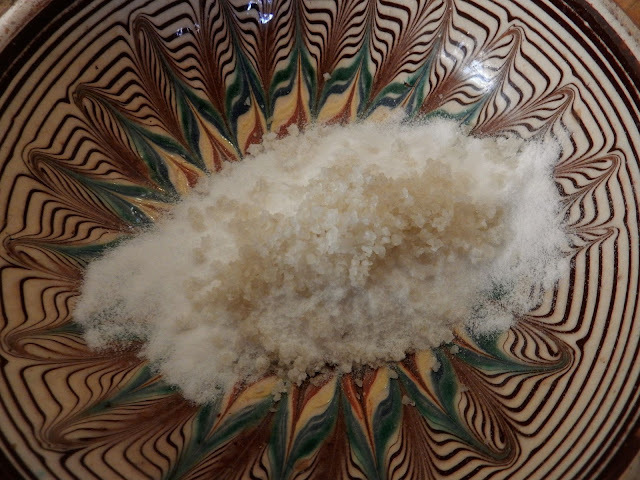 And though the vinegar is a major component, the real star of this show became my pouch of fleur de sel, also purchased from the shop. 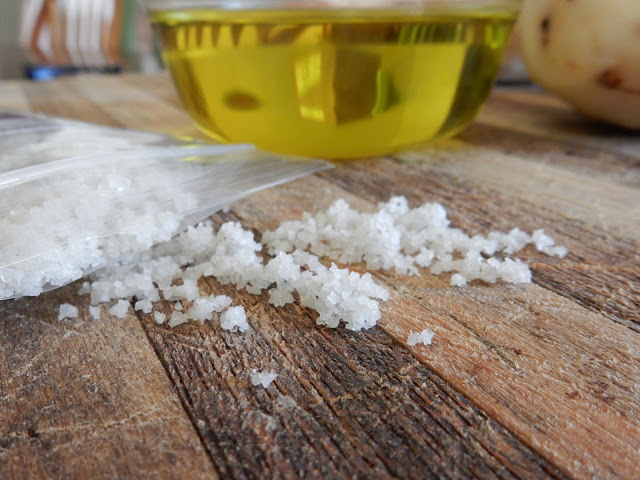 I'm a sea-salt girl and this French gray sea salt is the most flavorful, amazing thing I think you'll ever put on fries. Completely delicious. As an aside, searching "uses for vinegar powder" on Google comes up with surprisingly few results. Internet world, today I bring you an answer: salt and vinegar fries. I hope you become as addicted as I am. 1. 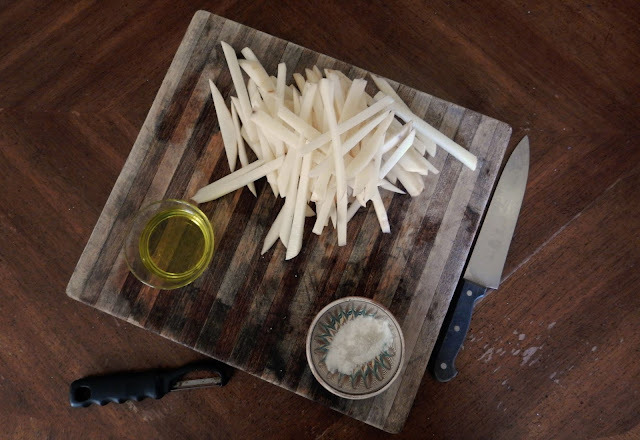 Start by prepping your trays with a generous drizzle of the olive oil. 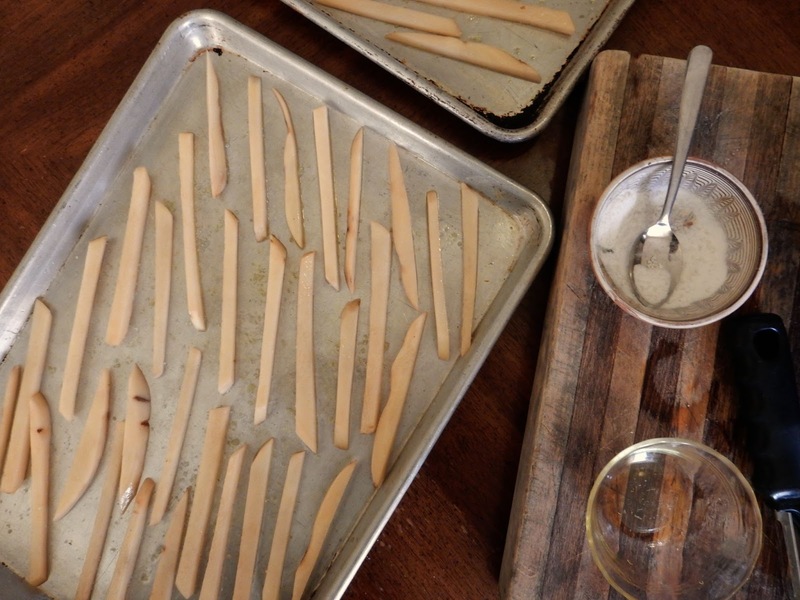 Sprinkle trays with a little of the salt to keep the potatoes from sticking. Preheat oven to 425 degrees Fahrenheit. 3. 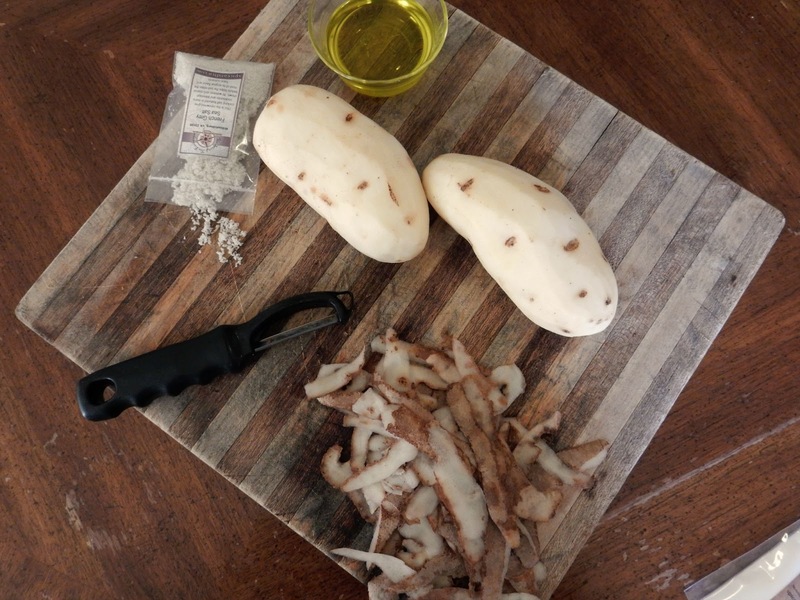 In a large bowl, toss potato matchsticks with remaining olive oil. Spread out on trays, careful to keep each slice well apart from the others. If they cook to close-together, they will steam instead of crisp and come out floppy and pale. 4. Dust potatoes generously with 2/3 of the salt and vinegar powder mixture and place trays in oven. Bake for 10 minutes. Flip with the grain and bake another ten minutes, until a dark, golden-brown. 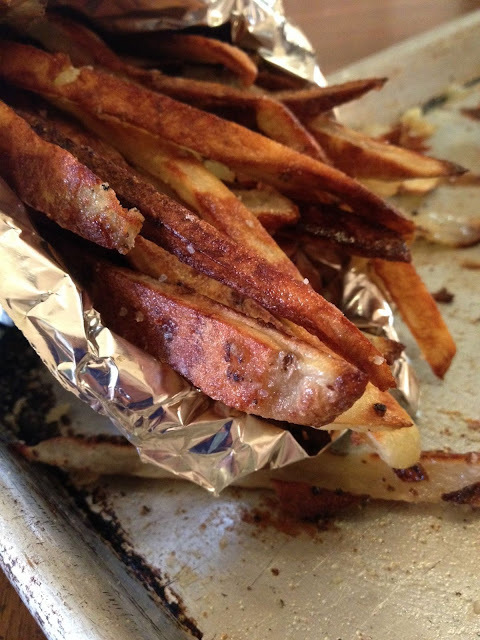 I like my fries darker than lighter, but if you have a preference for lighter fries, take them out a few minutes early. 5. Shake remaining salt and vinegar mixture over cooked fries and serve hot with malt vinegar. Have a lovely, lovely day and let me know if you give the fries a go! These will definitely go in my "frequently used" repertoire, never to be removed. 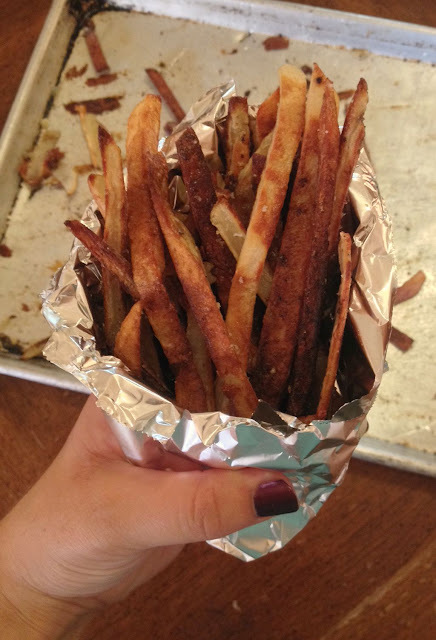 Because really, what's better for the very end of summer than a french-fry with pizazz? Nothing. Absolutely nothing.